Lead White is a fast drying, heavy consistency, flexible, opaque white with a very subtle reddish-yellow undertone and excellent covering capacity. Most artists stopped using this pigment over the last century because of its toxicity, but its working properties are positive enough to keep some artists using it. It is the most structurally sound white for underpainting. Lead White is quick drying, and it will help accelerate the drying time of any color it is mixed with. Lead White has excellent permanence and lightfastness. However, it may become discolored over long periods of time. 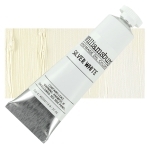 Lead White has historically been the most important of all white pigments. The use of this pigment dates back to the days of the ancient Greeks and Egyptians. It was the only white used in European easel painting until the 19th century, and it is one of the oldest synthetically produced pigments. It has been mostly replaced by Titanium White and Zinc White, depending on the opacity the artist desires. Biacca, Ceruse, Cremnitz White, Dutch White, Flake White, Flemish White, French White, Krems White, London White, Nottingham White, Roman White, Silver White, Slate White, White Lead.